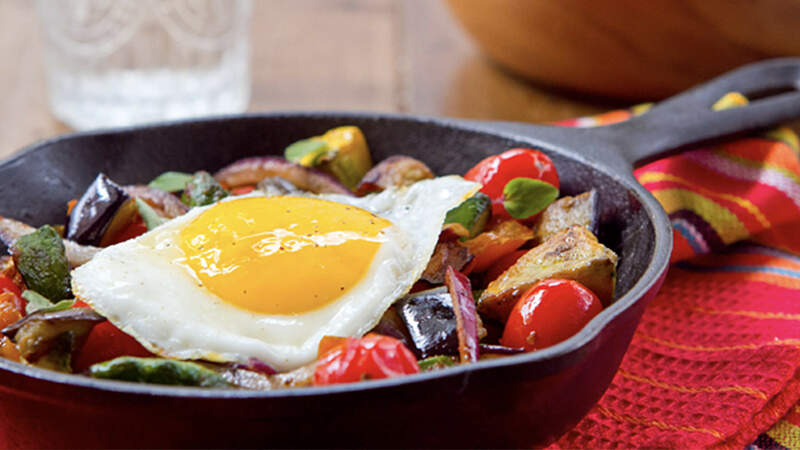 Spice up your breakfast menu with this perfect Fried Egg Ratatouille Hash, featuring plenty of veggies and a pop of spice. Breakfast hash is rated a top breakfast menu trend by chefs. Eggs, large --- 12 ea. Red onion, diced --- 3 ea. Yellow, red or orange bell pepper, diced --- 3 ea. Japanese eggplants, small, diced --- 3-6 ea. Yellow zucchini, large, diced --- 3 ea. Rosemary, fresh --- 3 Tbsp. Thyme, fresh --- 3 Tbsp. Oregano, fresh --- 3 Tbsp. Pepper, freshly ground --- 1-1/2 tsp. Combine 3 Tbsp. olive oil, 3 Tbsp. TABASCO® Green Sauce, salt and pepper in a small bowl. Set aside. In a large skillet (cast iron works great here) heat 5 Tbsp. olive oil over medium-high heat. Add the onion, bell pepper, and eggplant, and cook, stirring frequently, for 5 minutes until the vegetables become tender. Add the zucchini and grape tomatoes and cook for another 3–4 minutes until all the vegetables are tender and lightly browned. Whisk the reserved 4 Tbsp. of olive oil and TABASCO® Green Sauce and add to the skillet, stirring the vegetables to coat evenly. Reduce the heat to low while eggs cook. In another skillet, heat the remaining olive oil as needed (should be enough to barely coat the bottom of the pan) over medium-high heat. When the pan is heating, slide up to four eggs into the pan. Cook over medium-high heat for about 3 minutes. Use room temperature eggs and make sure the pan is hot before putting eggs in pan. When eggs are cooked (whites are set and the yolk has just firmed) carefully remove. Divide vegetable mixture among 12 plates and top each with a fried egg. Season with a pinch of salt and pepper and garnish with the fresh herbs.